First of all, happy Friday to everyone on this gorgeous day here in San Francisco. I hope your Easter weekend will go well. Currently, drivers have the discretion to allow or not allow strollers on their vehicles, and when a passenger is denied boarding, that has created some frustration. Current policy requires the child to be removed from the stroller and for the stroller to be folded-up. But with the new bigger, strollers that don't fold, and ones that do but takes up too much space, it seems drivers are booting more families from Muni vehicles on a more frequent basis. Two city Supervisors believes this problem is discouraging families to ride public transit, therefore the decline in the number of children in our city. I don’t agree with a universal city policy that a driver has to enforce, I believe independent judgment by the driver is the best policy because it’s the operators that have the ultimate responsibility to make sure all passengers are safe. Safety of the baby or toddler in the stroller. Strollers may move during motion of the vehicle, therefore if a driver has to slam their brake, the baby could fly out of the stroller. Some of you may be thinking, why not give them the wheelchair space? That’s a bad idea because that space is reserved for a wheelchair passenger, and those wheelchair areas take up three or four seats for passengers; should a stroller get the wheelchair spot? No because it takes up extra seats. Wheelchairs do have a designated spot by federal law, and all buses have straps to secure the wheelchair, but while Muni does not regularly do it, other agencies do as policy to secure both wheels with special hooks attached to the floor, have the wheelchair brakes locked in, and a seat belt around their waist. Strollers don’t have the ability because the seat belt might go around their neck, and the hooks on the ground may not be able to safely secure the stroller. Wheelchair lifts and ramps for streetcars are definitely not for strollers, they are for people who are disabled or have limited mobility. The “SUV” carriages we see with the larger rubber wheels and bigger frames takes up too much space on Muni and removes precious aisle space for those who needs to stand or pass by to board/exit the vehicle. Ones that can’t fold takes up too much space and should be banned, but even the ones that can fold and still take a huge amount of bulk should be banned too. As a courtesy to passengers, it’s discouraged to bring huge bulky items on Muni (for the exception of medical devices like wheelchairs, and walkers). You know what I’m talking about, garbage bags full of cans, and suitcases. If you want to transport bulky items, call a taxi or drive. I don’t have a concern for strollers that fold and takes a minimal amount of space because they fold up so compactly, similar to carrying a poster tube. First photo by Flickr user: Paul Barter, using a Creative Commons License. Second photo by Flickr user: 'andynash,' using a Creative Commons License. 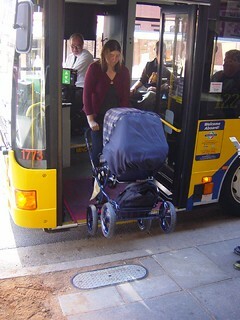 Tri Delta Transit allows strollers, have a space separate from the two wheelchair spaces. Many families ride the buses. Their buses are full seated, of course nothing crowded like Muni. 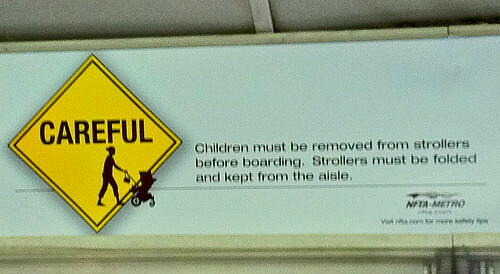 I really think that strollers should be folded, non-folding strollers are allowed only when it's not crowded. If families know that they would use public transit often, they should only buy folding strollers. Heavy bags with recycle items should not be allowed, especially when it smells or leaking. If the bag is not big and annoying, fine. But for suitcases, they shouldn't be banned. There are budget travelers everywhere. I always carry my suitcases on public transit in different US cities, never a problem. City bus is the cheapest ground transportation between airport and downtown. (In SF, BART is the best, but some people need to switch to a bus to their destination.) I use my suitcase for grocery shopping sometimes. I never drive or taxi. I know ways to store luggage on buses without blocking the aisle. Some spacing between seats is wide enough to store luggage. Would You Support Sunday Meter Enforcement?